In the interest of expanding the knowledge of this technique, I am taking the time to explain it here for the cyber knitting community. Let me preface the directions by saying that this nicely knotted edge was first illustrated for me in Beth Brown-Reinsel's book KNITTING GANSEYS, and reinforced when I took a class from Beth. She is a fabulous teacher, and her book is a wonderful companion to those of us who embark on making a gansey from scratch. Start by measuring a length of yarn twice as long as you will need for casting on the edge. My method: wind the yarn around the needle loosely 10 times...this length will do for 10 stitches. Measure that length, hand over hand, doubling it (20 sts), tripling it (30 sts), etc, until you reach the number of stitches just over what you need to cast on. Then DOUBLE the ENTIRE length of yarn in your hand. At this point, bring the cut end into your hand also, and make a slip knot with both strands of yarn, 6" from the cut end. Place the slip knot on a needle. Treat the doubled strand of yarn emanating from the slip knot as one yarn. It is labeled A. The single yarn is B. Now, work a yarn over AND a regular longtail cast on in sequence. This makes 2 stitches each time. 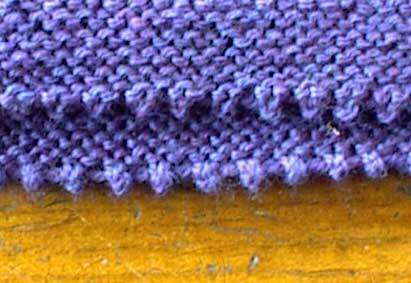 A bump AND a smooth stitch has been made each time. The first slip knot makes only one bump. If you need an even number of stitches, you can knit into each strand of the bump. a free pattern being written for the cybercrowd by moi! Click for free pattern !